We’d love your help. Let us know what’s wrong with this preview of The Homing Instinct by Bernd Heinrich. Acclaimed scientist and author Bernd Heinrich has returned every year since boyhood to a beloved patch of western Maine woods. What is the biology in humans of this deep-in-the-bones pull toward a particular place, and how is it related to animal homing? Heinrich explores the fascinating science chipping away at the mysteries of animal migration: how geese imprint true visu Acclaimed scientist and author Bernd Heinrich has returned every year since boyhood to a beloved patch of western Maine woods. What is the biology in humans of this deep-in-the-bones pull toward a particular place, and how is it related to animal homing? To ask other readers questions about The Homing Instinct, please sign up. Bernd Heinrich is one of my favourite authors. He always brings new insight into the natural world, and by describing animal behaviour, illuminates our own, as we are all connected and it is only by evolution we differ. This book starts off 10 star. I had thought that migratory birds found their way home by a sense we don't have or understand, but not so. There are many ways of homing, many different senses - navigation by the stars, by magnetism, by scent, by polarised light (maybe), by visual Bernd Heinrich is one of my favourite authors. He always brings new insight into the natural world, and by describing animal behaviour, illuminates our own, as we are all connected and it is only by evolution we differ. This book starts off 10 star. I had thought that migratory birds found their way home by a sense we don't have or understand, but not so. There are many ways of homing, many different senses - navigation by the stars, by magnetism, by scent, by polarised light (maybe), by visual clues that we can't see or even know about as yet. As a sailor I steered by the stars, smelled the scent of land (especially Brazil) before we could even see it, and learned that for flat, coral islands you could see their green reflections on the undersides of clouds before the island itself was visible and I marvelled at the ways birds flying past us, sometimes landing on the deck could find their way to wherever they were bound. Birds, insects, mammals, all of this was very interesting. But then Heinrich describes deer hunting (which he loves) in great detail. I saw what he was getting at, his 'home patch' year after year recognisable in details, 'the dead tree stump', 'the rocks by the ...' by both his hunting buddy and the deer that went there. He talked about his family's fraught, protracted journey to the US through Germany, and how people had made the family welcome and given them a home. And later he talks of the process of building a second cabin, how long it took to (unconsciously) decide where it should be and likened it to the try-outs of birds with nesting sites. This wasn't that interesting. so it isn't the year's first 10 star book I thought it would be, but still 5 star, it's still going to be one of the best books I will read this year. Written on reading the book. 1. The albatross may leave it's place of birth and soaring over the oceans, never be within site of land again for 7 or 8 years. Then it will return to where it was born to mate for life and to breed. It may fly up to 1500 Km to find a good meal of giant squid and, filling its crop return directly to its single chick. "It always knows exactly where it is." Marvellous. 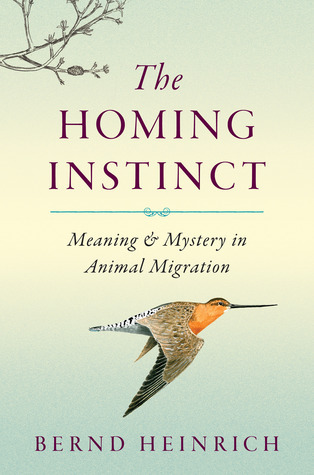 From the title of Bernd Heinrich’s new book, The Homing Instinct, I was expecting a scientific exploration of the migratory behaviors of birds and other creatures that embark on long journeys to and from their breeding grounds, but I found, along with science, an introspective look into the nature and the need to return home. Mixed in with the science, both the author’s own research and that of other scientists, I discovered a beautifully written book consisting of many stories and observations, From the title of Bernd Heinrich’s new book, The Homing Instinct, I was expecting a scientific exploration of the migratory behaviors of birds and other creatures that embark on long journeys to and from their breeding grounds, but I found, along with science, an introspective look into the nature and the need to return home. Mixed in with the science, both the author’s own research and that of other scientists, I discovered a beautifully written book consisting of many stories and observations, giving many parts of the book the feel of a memoir. Present throughout is the theme, ‘What is home?’ and ‘Why do all creatures, including humans, feel that pull to return to the place they are from?’. The Homing Instinct is divided into three sections, the first part delving into homing behavior using the examples of Sandhill Cranes, Monarch butterflies and honey bees to name a few, and their remarkable ability to navigate by the sun and stars, recognize landmarks and arrive at their destination without getting lost. In the second part the author discusses homemaking behavior: types of homes or nests and how to choose the spot, and not only for the animals, this also applies to humans and he uses the example of his own family home and land in the woods of western Maine. In the third part, herding behaving and homing to each other rather than a place is discussed. There is much to like about Heinrich’s approachable and engaging writing style, and enjoyable stories and anecdotes. In one of my favorite chapters we learn about a web orb spider that made her home inside his home. For two summers he observed and chronicled her behavior, even naming her Charlotte, and in the end discovered that her actions did not follow established spider lore. Another favorite was the story of an old apple tree that he dated to 1790 and his research into the mysterious origin of the tree. Of much interest to me was the sad tale of the now extinct Passenger Pigeon, a victim of man, but also of its own biology and its need to return in enormous size groups to only a few nesting grounds, making it easy prey for hunters. Fact: my last name is name of a tiny village in southern India where storks and herons migrate post monsoon season. When I visited this village several years ago, the villagers mention how the birds move around the area with familiarity. In this book, Heinrich wonders over the necessity of migration, the pull the birds and insects seem to have to a place, to a season. Its a very calming read as Heinrich gently unfolds one of the most natural and mesmerizing aspects of birds. I had high hopes for this from the title but was sorely disappointed. A mishmash of information, presented poorly. The autobiographical chapters were self-indulgent and the hunting one was just appalling. Some of the wildlife writing was good but there just wasn't enough of it, which is why ultimately it was such a let down. I like his writing style and his insights, and this book is good for people who don't want a deep dive into the evolutionary science & can appreciate that what Heinrich is writing is both metaphorical AND scientific. It has a few chapters that don't mesh well with the rest of the book, as though written separately (as I assume many of them were) and then an editor said to add it here. The hunting chapter is one of those--it fits, sort of, but not seamlessly, as some of the other essays do. Finally! It took me a while to get through this, but I was distracted, between big life events and many of the other books I want to read, have started to read, or finished reading since my last post. This is the first Bernd Heinrich book for me to read; I had been wanting to read something by him for a while. At first I wasn’t sure, but I think this was a good one to start with. It is a collection of loosely related pieces. About half of the book is about the science of migration, and the othe Finally! It took me a while to get through this, but I was distracted, between big life events and many of the other books I want to read, have started to read, or finished reading since my last post. This is the first Bernd Heinrich book for me to read; I had been wanting to read something by him for a while. At first I wasn’t sure, but I think this was a good one to start with. It is a collection of loosely related pieces. About half of the book is about the science of migration, and the other approximate half is personal memoir, pertaining to the author’s own homing instinct. The timing proved to be appropriate for me, in a symbolic way: the day I began reading, and the day I finished, I was away from home, but in between, and for over a year now I have been at home and wanting to move on. However, I love my home, and understand Heinrich’s feelings about the Maine woods he grew up in. So many subjects are covered in this book, and maybe it tries to cover too much. As a whole, it could be more cohesive, but it is well written and any chapter is enjoyable on its own. How does he decide what to include?, I found myself wondering. His familiarity with so many organisms and the science pertaining to them serves this book well. The sketches are also a nice supplement to the text. The bird on the cover, for example, is a bar-tailed godwit, which can fly across the Pacific Ocean non-stop! It does this after nesting in Alaska, flying to Australia or New Zealand. Flying from there to Alaska, it makes a few stops, and in these flights changes its body weight by 2-3 times. This is just one of the many profiles crammed into the book. All are fun to read. Each species is unique in its homing “instinct” and he acknowledges this. Sandhill cranes are the opener, and bees buzz among many pages. I didn’t know there were no bees in North America until the colonists brought them here in the early-mid 1600s. To give a sense of what the author’s personality might be like, he counted over 500 of one species of insect while jogging (as recorded in a journal of his in 1985). Also, later in the book he compares his own physiology to that of a bee. The chapter “By the Sun, Stars, and Magnetic Compass” seemed more organized and flows better, though maybe I was more focused when reading it. In general I tend to enjoy books more if I can read them in short periods of time with extended “sessions”. Reading a little bit here and there (for the first time) is usually less pleasant, so that may bias my reviewing. “Home-making in Suriname” was only loosely related to the theme of the book, but is a good stand-alone travel adventure that found its home in this text and comes away with a nice message. The setting reminded me of “The Lost Steps” by Alejo Carpentier, for better or worse, and it is exciting to read about a challenging excursion into one of the few still-pristine places. In the last chapter of the second section about how communal homes first arose, the mentioned hypothetical speculation happened around the time the expected processes were observed in real species. Perhaps this inspired him to speculate on the unpleasant topic of population control of the Homo genus. In one of the ‘personal’ chapters at the cabin in the woods, there is a real-life Charlotte the spider. Her story is drawn largely from the author’s journal, where it is evident that he is a keen observer of his wild visitors and their behavior. This is in addition to the experiments of others – some simple, some quite clever – that spice up the book. His own backyard home experiments with Chestnut trees are a demonstration of boundaries by seed dispersal, and are a nice conservation effort. Heinrich’s relationship with his nephew is a good one, and brings a real human element to this interesting collection of natural histories. The book’s epilogue is like a short chapter, a biograph, the family’s connection to the land and to other people there. I can say that I got a few interesting facts out of this read, and at a less busy time of my life I look forward to reading more of the author’s works. I’ve always been fascinated by the homing instinct, and particularly the history of science being unable to completely explain how it works. So I appreciated the opportunity to read Heinrich’s new book all about the homing instinct. And it is all about the homing instinct. Quite a lot, even for a reader so interested in the subject. Birds, animals, insects, amphibians, humans are all included. I appreciate and agree with his predicating his descriptions of the creatures with, “I realize that this I’ve always been fascinated by the homing instinct, and particularly the history of science being unable to completely explain how it works. So I appreciated the opportunity to read Heinrich’s new book all about the homing instinct. And it is all about the homing instinct. Quite a lot, even for a reader so interested in the subject. Birds, animals, insects, amphibians, humans are all included. I appreciate and agree with his predicating his descriptions of the creatures with, “I realize that this smacks to some of anthropomorphism, a pejorative term that has been used for the purpose of separating us from the rest of life.” However, many of the homing instincts he attributes to humans feels a bit sentimentalized, more of the spiritual than the literal and physical. I’m perfectly accepting of attributing emotion and empathy to animals but then to attribute most of the whole of homing motivations in human to these sentiments feels too biased for me. Heinrich Heinrich's writing is comfortably both scientific and intimate. He writes of studies and scientific observations, but many of those observations are his own. I enjoyed Heinrich's black and white sketches of the insects and animals he observed scattered throughout the book, which made it feel even more personal, like a journal. A reader more scientifically focused may not appreciate this, but this is why I like writers of Heinrich's ilk. I'm attracted to these sorts of books because of the scientific elements but am often better engaged by autobiographical frosting. I never fully understand (especially when I kind of feel this way myself), when a reviewer writes that they feel that a book was too long; it is as long as it is because the author felt the included material was important. But sometimes maybe they feel longer when the subject is so throughly exhausted that it leaves the reader exhausted? This is an interesting book by Bernd Heinrich, a renowned scholar that discusses interesting facts about animal migration and their attachments for their habitats. The book is largely focused on behavior with no discussion of genetics as it relates to the behavior, and no prior knowledge of biology is required to understand and appreciate this book. Homemaking is practiced by animals regardless of their position in the evolutionary ladder. It is especially important for rearing young until they are ready to face challenges of the world. It is most prominently displayed among insects and birds but also in some mammals, spiders, crustaceans, fish and some reptiles. Many examples are discussed, for example, Loons in Northern Lakes fight viciously every spring for the possession of the only spot to nest on a Beaver lodge and where only one pair stays and the others must go quite far to find any place at all. Rules change when nest site is no longer arbitrary and becomes unique and valuable commodity. It may be built at a great cost and skill in which case it becomes a nuptial offering of competing males. Thus in weaverbirds and woodpeckers, males do most of the site preparation and female inspects it and chooses the best site and the male who built it. It is all the matter of costs and benefits of leaving verses staying and fighting. What knowledge birds have that they fly nonstop all day and all night on the wing and losing significant body weight. Albatross is like sea turtles, long lived wanderers with fixed home positions. Young albatrosses fly an average distance of 84,000 miles a year and have a genetically fixed dispersal direction but always return home for breeding. The take home message from this book is that all animals have the basic instincts for their homes just like humans. Animal behavior is also discussed on many cable programs such as; Nat Geo, Discovery channel, Science channel, etc., but it is nice to read this book because this book has lot more materials than a television show. I recommend this book to anyone interested in animal behavior. I was expecting to understand more thoroughly the mechanisms that drive the homing instincts of animals, so 20 minutes after beginning the book, I was disappointed. But I kept reading and suddenly I realized that I was holding a book that offered something better. It seems that we are still unraveling the secrets of homing, and what Heinrich gives us are example after example of homing in action. Observations galore, experiments, and wonderful sketches abound through the book. I was able to just relax and stroll through the book, enjoying the descriptions as a layperson with an inquisitive mind. Sometimes there is TMI and one has to struggle to grasp the fine points (e.g., molecular structure or chemical reactions) - That is not the case here: the reader is left with that sense of wonderment about life forces that we had when we first started asking “why? how? what?” as kids and young adults. Caleb's work has book club and this was the first book. I really enjoyed lots of it, from albatross to bees to monarchs to godwits and so much more, the migration and making of homes was discussed and it is all very interesting. Another in the club and I were a little unsure if this is a popular book about science (sometimes discussing animal's emotion would fall here) or a book 'preaching to the choir' of scientists (some of his deeper analysis of research would fit here). It was also part memoir Caleb's work has book club and this was the first book. It was also part memoir, part philosophizing on home and movement. I do like that he said all we learn about the nature world creates more questions about what we don't yet know. And that as humans we are homebodies who also feel the need to go and explore (Moana anyone? "I am a girl who loves my island, I love the sea, it calls me"). The first half is interesting and scientific in focus, the second half is a bit more autobiographical and sometimes reads as a series of vignettes stitched together. It’s fine if you want to read about the Maine woods, hunting, local history sprinkled with animal and plant details. But i was expecting it to deal more in detail with homing and migration (why, how). I get the sense some of the scientific questions are not completely settled. It was an interesting read. a little to detailed for me but that is probably because I read mostly fiction. I giving it three stars not because it wasn't a great book on the topic, it just did not appeal to me. I found the writing style very bland so it took me forever to read. But it was a good book. Good writing, just not a cohesive book. A book stuffed with interesting knowledge and stories about how insects, birds and fish find their way and build homes. Heinrich writes about entire species as if they were friends he knows. Such a fantastic read! Toch een beetje ontgoocheld. Ik kom wel van een buitengewoon boek, van Jennifer Ackerman, met hetzelfde onderwerp. "Begs the question" used for "raises the question". I soldiered on for a little longer, but it couldn't hold my attention after that little bit of illiteracy. Honestly, I was pretty excited about this book. The title and summary seemed like something that would be really interesting to me. There was quite a bit that I learned or was intrigued by in this book... I am going to share some of those thoughts/passages in my review because I really appreciated Heinrich commenting on and bringing them forth in his book. Yet, there are some things that really hold me back from rating this book higher than a three. It basically has to do with organization of tho Honestly, I was pretty excited about this book. The title and summary seemed like something that would be really interesting to me. There was quite a bit that I learned or was intrigued by in this book... I am going to share some of those thoughts/passages in my review because I really appreciated Heinrich commenting on and bringing them forth in his book. Yet, there are some things that really hold me back from rating this book higher than a three. It basically has to do with organization of thoughts and some of the chapters, while interesting, really had little to no bearing on the overall idea of homing. If they did, Heinrich did not complete his thoughts to the reader. I really didn't like how some chapters focused on one species of animal and then others were just a summary of an idea and Heinrich just described how certain species fall in line with the scope. I felt it should have been one way or the other - it would have been more cohesive. Also, Heinrich discusses his own experiences and life as a form of explaining human homing but he gives too much detail at points and the meaning is lost. Anyways.. Here's a few pointers that I truly appreciated and loved..
People, wake up -- what is the point of all this destruction of nature when we have to waste time and $$$ to recreate it?! AHH!! "Is it possible that in some pre-agricultural bands of humans or pre-humans conflict was reduced and the society preserved by some of its members willingly forgoing reproduction? Is it only a wild speculation to imagine a nonfertile segment of the society who, rather than destructively procreating, are creatively aiding?" Heinrich discusses this in reference to the fact the insects do this.. but who is not to say this DOES happen now! I know several people that have had trouble conceiving - but perhaps there is more to this - maybe they never were supposed to - as sad as that sounds -- maybe we are evolving to do this purposely? Who knows? We never have looked at it from that perspective... Something I am seriously pondering. In discussion of human navigation... "...we have almost no innate homing navigation mechanisms." Maybe it's no longer innate - perhaps we evolved and this was lost. I feel like humans at one point knew a whole lot more about their surroundings innately than we do now. It must be learned now because we do not have to depend on these navigation mechanisms for survival as we once did. We're familiar with birds migrating even if we don't know exactly how they get to precise places each year. We also know that salmon can find their way back to the same rivers and lakes where they were born, and eels do that in reverse, being born in the ocean and spending their lives in rivers before returning to the ocean to spawn. But these behaviors extend to many other animals and in different ways. Some butterflies migrate, and even though they may not complete the journey, their offspring We're familiar with birds migrating even if we don't know exactly how they get to precise places each year. We also know that salmon can find their way back to the same rivers and lakes where they were born, and eels do that in reverse, being born in the ocean and spending their lives in rivers before returning to the ocean to spawn. But these behaviors extend to many other animals and in different ways. Some butterflies migrate, and even though they may not complete the journey, their offspring will. Grasshoppers swarm at certain times of the year, bees find their way back to the hive, and ants return to the nest. How do pigeons know where home is, or sea birds find land, or turtles migrate? And what about people? Aren't we drawn to home, if not always, at least at different periods of our lives? Pretty bad. A few interesting nature facts. Heinrich thinks we are interested in his life & family. Boring. It is about time I admit I am not going to finish reading this book. Based on the title, I expected something poetic and literary that used animal migration as a jumping-off point for larger discussions about life. In reality, the book was heavy on science and minute details about migration that I jut did not find interesting. Perhaps it takes a turn in later chapters, but I simply don't have enough interest to keep going with it. This book was so much more than I initially expected it to be. My daughter bought it at a library book sale and, ironically, gave it to me as I was helping her move from one home to another. Based upon the title and the picture of a bird on a cover, I thought it was about bird migrations, but it is about the definition of home, the nesting instinct, the homing instinct, evolution and extinction...and it's not just about birds, but spiders, locusts, bees, extinct passenger pigeons, and even human This book was so much more than I initially expected it to be. My daughter bought it at a library book sale and, ironically, gave it to me as I was helping her move from one home to another. Based upon the title and the picture of a bird on a cover, I thought it was about bird migrations, but it is about the definition of home, the nesting instinct, the homing instinct, evolution and extinction...and it's not just about birds, but spiders, locusts, bees, extinct passenger pigeons, and even humans. Fascinating observational stories about behavior, mixed with philosophy. "...from space they [astronauts] saw no boundaries, and the whole Earth suddenly seemed like home. We went to study the moon but saw the Earth instead. Ironically, perhaps, it is our technology that took us to the moon and beyond, and our technology has literally had global effects and therefore made the whole Eart our home, whereas before it was divided by boundaries of separate home. Now, by looking into the rearview mirror, so to speak, we see the reality of what we did, in a physical image of what is our communal home." "Will we, like a school of fish confronting a whale, continue our until-now proven survival strategies of massing together, or will we see, and change to something new?" 'Een verzameling van feiten en anekdotes van en over Bernd Heinrich, gekruid met een vleugje wetenschap' zou een betere titel geweest zijn. Over het trekinstinct van vogels en andere migrerende dieren, gaat het enkel in de eerste honderd pagina's. Daarna krijgen we een opsomming van feitjes over allerlei soorten dieren, af en toe gelinkt aan het 'thuisgevoel' van de soort, maar soms ook ogenschijnlijk willekeurig. Daarnaast zijn deze 'feitjes' vaak anekdotes, waarvan he Wat. Een. Teleurstelling. 'Een verzameling van feiten en anekdotes van en over Bernd Heinrich, gekruid met een vleugje wetenschap' zou een betere titel geweest zijn. Over het trekinstinct van vogels en andere migrerende dieren, gaat het enkel in de eerste honderd pagina's. Daarna krijgen we een opsomming van feitjes over allerlei soorten dieren, af en toe gelinkt aan het 'thuisgevoel' van de soort, maar soms ook ogenschijnlijk willekeurig. Daarnaast zijn deze 'feitjes' vaak anekdotes, waarvan het wetenschappelijk niveau of belang soms ver te zoeken is. En sommige feiten zijn gewoon fout. Bossen in de krater op Mount Meru? Mooi niet. Wie wil achterhalen hoe het nu juist zit met dat trekinstinct van dieren, zal door dit boek op zijn honger blijven zitten. Maar goed, het boek is vlot leesbaar (kudos voor de vertaler! ), staat mooi in je boekenkast en het is best wel goed geschreven; vaak verschijnen de beelden van de beschreven dieren zo voor je netvlies, alsof je naar een BBC documentaire zit te kijken. Als je daar naar op zoek bent, is het een prima boek, maar dat is waarschijnlijk niet zo'n catchy ondertitel. This is a fascinating book about the natural world--the kind of book that one might need to read more than once because it is so full of information. It is about more than just animal migration; mating, food selection, and many other topics are also covered, and botanical information as well. I really appreciated how the author tied together information gleaned from his studies as a distinguished biology professor as well as his own life--spanning many years--to reach conclusions that make the b This is a fascinating book about the natural world--the kind of book that one might need to read more than once because it is so full of information. It is about more than just animal migration; mating, food selection, and many other topics are also covered, and botanical information as well. I really appreciated how the author tied together information gleaned from his studies as a distinguished biology professor as well as his own life--spanning many years--to reach conclusions that make the book a personal, human journey and tie us to the animal world. An amazing find. Heinrich patiently and lovingly examines the homing instinct of birds - from bumblebees to cranes - and relates them to humans. The science is delivered as poetry and he writes in a tactile and sensuous manner. Even the concept of applying homing instincts to our own species - to explore how birds can inform us of our own understanding and functions of "home" - well, it is masterful and beautiful in an Einsteinien way. Better yet, the book is part-bio - as the author relates the An amazing find. Heinrich patiently and lovingly examines the homing instinct of birds - from bumblebees to cranes - and relates them to humans. The science is delivered as poetry and he writes in a tactile and sensuous manner. Even the concept of applying homing instincts to our own species - to explore how birds can inform us of our own understanding and functions of "home" - well, it is masterful and beautiful in an Einsteinien way. Better yet, the book is part-bio - as the author relates the personal aspects of his life that enables him to do this. I picked this up at a garden centre near Wakefield in West Yorkshire last week. I'm freshly wrung out with a compelling sense of serendipity. Peers in my intellectual circle have already noted or camera-shot the book cover for their own references. Bernd Heinrich was born in Germany (April 19, 1940) and moved to Wilton, Maine as a child. He studied at the University of Maine and UCLA and is Professor Emeritus of Biology at the University of Vermont. He is the author of many books including Winter World, Ravens in Winter, Mind of the Raven and Why We Run. Many of his books focus on the natural world just outside the cabin door. Heinrich has w Bernd Heinrich was born in Germany (April 19, 1940) and moved to Wilton, Maine as a child. He studied at the University of Maine and UCLA and is Professor Emeritus of Biology at the University of Vermont. Heinrich has won numerous awards for his writing and is a world class ultra-marathon runner.